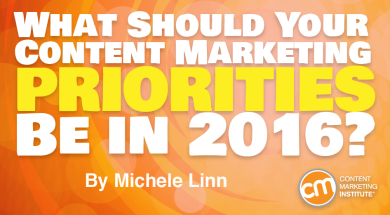 What Should Your Content Marketing Priorities Be? A few months ago, I was cleaning the basement with my kids. The goal was to put the toys away so it could be vacuumed, dusted, etc. I looked over, and my 8-year-old was erasing the whiteboard and chalkboard. When I asked her to help clean up, she explained that she was cleaning. The whiteboard obviously needed to be erased. While it wasn’t a proud parenting moment, it was an aha moment. How many of us spend time doing something that doesn’t help a goal (erasing the whiteboard) instead of doing something that truly needs to be done (picking up the toys)? Our annual content marketing research asks marketers to select their top five priorities from a list of 10. Below I look at all 10 and discuss when each may be something you may want to prioritize – and when it might not be. My goal for this post isn’t to add more things to your list but to take some things off – or at the very least prioritize some of these activities lower on your list so you can focus on what is most important. Your order may be a bit different, based on the maturity of your content marketing program. However, you can use this list, which starts with the activities most organizations should be prioritizing. However, what you rank as important in your organization may vary, so use this list as a guide so you can have conversations with your team on what you should prioritize so you are all working toward the same goals. Bonus tip: If you are struggling to truly prioritize, consider using the Agile process. Andrea Fryrear answers some common questions to help. But that’s a vicious circle. If creating more-engaging content is a top priority, chances are that you need to spend more time understanding your audience and documenting what you learn in personas so everyone from your team is working from the same page. In general, making your content more engaging should be a priority. As Jay Acunzo recently explained, we need to become truly creative to create more-engaging content. Engaging means creating content your audience will want to read. You can’t go wrong in honing your craft. Before you make creating more-engaging content a high priority, you need to understand what “engaging” means to your brand. More shares? Better readability? If your team doesn’t know your definition of engaging – and how to measure it – it will be tough to make headway. In this case, get clear on what success looks like for your team – that’s the higher priority. Insanity is doing the same thing again and again, and expecting different results. If you aren’t measuring what’s working and what isn’t, you can’t know if you are making progress – or truly being that informative source for your audience. Understanding what is effective should be a priority if you need to convince your C-suite that the content marketing budget should increase. It also should be a priority when you’re looking to expand a certain tactic/part of your content marketing or to cut back on something. Data is great, and applying lessons about what is working is always a good idea, but don’t get so stuck in the quantitative that you forget the qualitative. Said another way: Understand what is working, but don’t become so obsessed with the metrics that you stop thinking creatively and trying new things. Content is an investment, so you want to get the most from it. Repurposing should be a high priority when you have a key piece of content that’s core to your story and can be broken out in multiple ways. It is also a good idea when your audience is on different platforms or they consume information differently. In these types of cases, repurposing your content in different ways is important. I’m not a fan of repurposing content into other formats to simply check a box. For instance, before you rush to create a talking head video of your latest white paper, ask yourself if this format really helps get your message across/adds clarity. You want to get more from the content you create. Optimizing includes everything from developing your SEO strategy, to A/B testing your landing pages, to running tests in email. In general, include optimization as a top priority in your ongoing work so you can continually improve your customer experience — as well as your bottom-line results. Optimization can feel like a never-ending proposition. What do you optimize? Figure out your top two channels and optimize your content for those. Don’t try to optimize everything. Visuals can aid in comprehension, especially when you are explaining something complex. They also can increase visibility and shareability, which is especially important when social media is core to your strategy. Will the visual help explain something more clearly than you can do in text? Are you sharing the content on a platform that relies on visuals? If creating more-engaging content is a high priority, becoming a better storyteller probably should be too. Storytelling is designed to engage your audience by humanizing your brand. It can allow your content to stand out from everyone else’s. Remember this: No one has the combination of your experiences and knowledge, so use your personality instead of hiding it. You also engage your audience for a longer time because you’ve crafted a story with a beginning, middle, and end. Or you can use elements of storytelling to attract your readers and make your content more relatable (for instance: the anecdote at the beginning of this article [hopefully]). Not all content needs to be a story. If your brand concentrates on how-to content, storytelling isn’t a high priority. If your audience responds well to straightforward explanations, storytelling probably isn’t that important. In all cases, though, clear, useful content should be your focus. When our team reviewed the preliminary results of the research, we were dumbstruck that the last-ranked priority for many marketers is becoming a stronger writer. Really? How can you have more-engaging content if you can’t write better? How can you become a better storyteller? We were so surprised by this, that we discussed it in depth at our research roundtables. The panelists were also stupefied by the priority ranking, but they offered many tips on how to improve one’s writing. If you are trying to make your content more engaging, you need to prioritize becoming a better writer. Not every job related to content marketing necessitates strong writing skills. If you are new in an industry or if you are in an industry replete with competition, curation may be a great bet. Instead of trying to add to the noise, figure out what makes the most sense for your readers and surface that. You can then be seen as a source of truly useful information. If you can create content that is better and different than what is already available, spend your time on creating original content that provides an answer or a new way of looking at an issue. If you can personalize your content in a way that people will appreciate, and if you can justify the expense, plan it and give it a try. Otherwise, save yourself the headache. If you don’t have a good grasp of the more fundamental priorities such as understanding your audience and creating engaging content, chances are you don’t need to prioritize personalization just yet. While priorities will vary depending on your content marketing program’s maturity and needs, review your documented content marketing strategy (the first and most important priority) to evaluate and rank your other priorities. Once you have handled these three priorities, you then can prioritize the more specific tasks to create even more-engaging content (storytelling, becoming a better writer, curating, visualizing) and to get the most from your best content (repurposing, optimizing, personalizing). Let us know your thoughts: What are your priorities? What would you like to take off your list? Your top priority for today should be to register for Content Marketing World before early-bird savings ends May 31. Use code BLOG100 to save an additional $100.